Just as thought-leaders are considered innovators at the forefront of their fields, nurse leaders are considered innovators in the field of nursing. As experienced members of the nursing community, their opinions are highly sought after and valued, both in academic and clinical circles. Demonstrating achievement in nursing through scholarship, leadership, service, or practice is only one of the nurse leader requirements for Sigma membership, but according to Sigma member and Xi Iota Chapter President Stephanie Baker, it’s a sign that you’re on the right path. There are a significant number of Sigma members who joined Sigma as nurse leaders and have continued to prove themselves worthy of both the title and the invitation. Though the path to induction may vary, those who join Sigma continue to elevate not only their own careers, but also the field of nursing. Stephanie received an invitation to join Sigma during her time in an alternate entry MSN bridge program at East Carolina University; once during the accelerated RN portion of her program and once during her MSN program. During that time, she had accepted a teaching position at Midwestern State University as an assistant nursing faculty member and realized the benefits and advantages that accompanied a Sigma membership. She quickly accepted the invitation for membership and has been a member of Sigma for the past three years. Stephanie’s induction also allowed her to increase her involvement in her local nursing community and encourage her students to pursue the opportunity to join Sigma as a way expand upon their own leadership skills. In addition to her role as chapter president, Stephanie has served both as a member and then chair of Xi Iota’s Governance Committee ― leadership opportunities that she wouldn’t have been exposed to without her induction as a nurse leader. The resources and benefits that accompany a Sigma membership continue to benefit a career in nursing, regardless of the specialization. Although Stephanie does wish that she had joined Sigma as a student, she’s happy that she joined when she given the opportunity a second time. 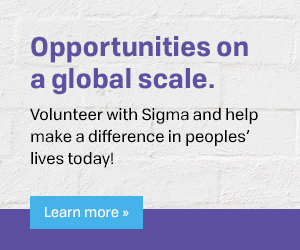 “Having the opportunity to join later as a nurse leader allowed me to take advantage of everything that Sigma had to offer, allowing me to gain experiences and take part of opportunities that truly elevate your career to the next level, regardless of specialty or where you are in your career,” Stephanie said.